This time of year in Texas the beets are massive and abundant and Brussels sprouts are still available in farmers markets. This recipe is ideal for taking advantage of seasonal produce and the fantastic spring weather. This recipe was prepared for us by Elliott and Spencer Gall – Thanks! 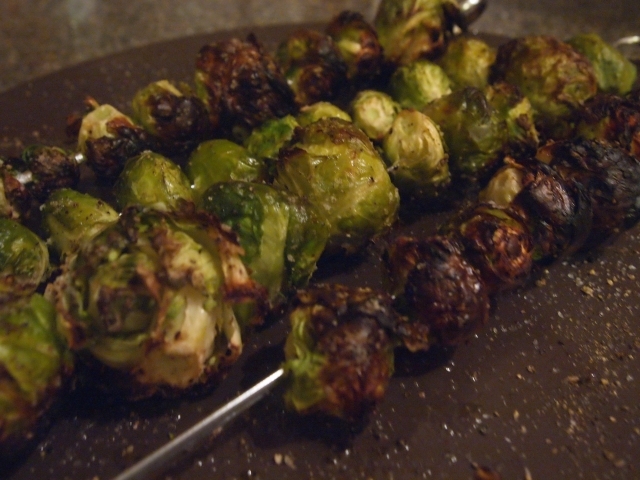 Sprouts, hot off the grill. Wash, halve, and skewer Brussels sprouts. Brush lightly with olive oil and sprinkle with salt and pepper. Grill on medium heat, about 350 degrees Fahrenheit, until slightly browned and tender. Carefully remove from grill and skewers and coarsely chop. Set aside. Thoroughly wash the beets and their greens. With a sharp knife, remove the greens and set aside. Wrap the whole beets in tin foil and broil on high, about 500 degrees Fahrenheit, in the oven for 20-30 minutes or until tender. While the beets are cooking coarsely chop the greens and saute in 1 tablespoon olive oil with garlic and salt until wilted. Remove from heat and set aside. When the beets are tender, carefully remove from the oven, unwrap, and submerge in cold water. Allow the beets to cool for about 5 minutes then gently remove the skin with your fingers. Transfer the broiled, peeled beets to a cutting board and slice into 1/8 inch thick rounds. Set aside. Prepare your dough by stretching it out on a clean flat surface until it is about 12 inches around with a uniform thickness. Liberally brush the top of the dough with olive oil. Transfer the dough, oiled side down, to a medium heat grill. Grill for 45-60 seconds or until the underside of the dough stiffens and grill marks appear. Using a heat resistant brush, liberally apply olive oil to the uncooked side of the dough then, using tongs, flip the dough. Grill for another 45-60 seconds or until the second side of the dough is stiff and grill marks appear. 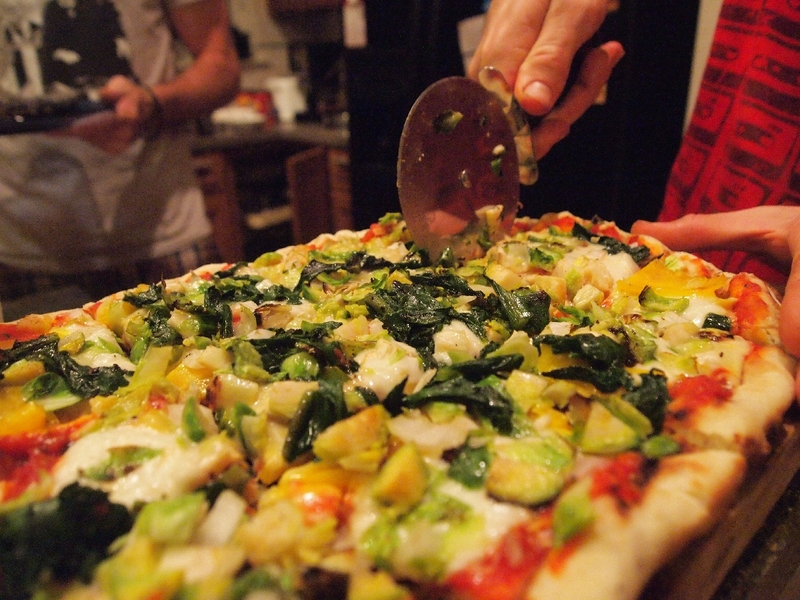 Remove the pizza crust from the grill and build your pizza by spreading out a layer of sauce, adding a layer of beet slices, covering with beet greens and Brussels sprouts, and topping it all off with grated mozzarella. Return the pizza to the hot grill and cook, rotating occasionally to prevent burning, until the cheese melts, 5-10 minutes depending on how much time the grill lid is closed. Remove from the grill, slice, and server immediately with your favorite pizza accouterments.